Hello and welcome to the Reside Daily Bite; I’m your host, David Doucette. Today I want to talk to you about an article that recently came out of CNNMoney.com and it is titled, “Unemployed? Get a Federal Loan to Help Pay Your Mortgage“. An interesting program and what homeowners will be able to do is apply for a no-interest government loan for up to $50,000 to pay your mortgage and cover your arrears. What it will do is it’s going to offer assistance for up to two years and it will be forgiven if the homeowner stays in the house for five years. Let’s take a closer look. Hello and welcome to the Reside Daily Bite; I’m your host, David Doucette. And some very exciting news coming out of the interest rate department last week. The San Francisco Chronicle reported that interest rates have dropped, on a 30-year loan, to 4.19% – that’s the lowest rate we have seen in decades. 066. What is a Short Sale? Welcome everybody to the reside Daily Bite; I’m your host, David Doucette. I want to let you know about a podcast that is currently on my website, residerealestate.com/podcast called “What is a short sale?” I have the good fortune of having in the studio (in the office) to interview, Toni Patillo of LA City Short Sales. Hello everybody and welcome to another episode of the Reside Daily Bite; I’m your host, David Doucette and today, I want to talk to you about a trend that was reported in the New York Times recently about Refinancing into Shorter Loans and their saying homeowners are starting to do that and it is becoming more of a trend. And the Gold Standard has always been a 30-year fixed loan. What we’re seeing with refinancing is people are refinancing into a 15-year loan. So, what that means is less time to pay-off their home; it’s going to be higher monthly payments but a lot more of your monthly payment is actually going to go towards the principal on the loan rather than the interest. Hello everybody and welcome to another episode of The Reside Daily Bite; I’m your host, David Doucette. 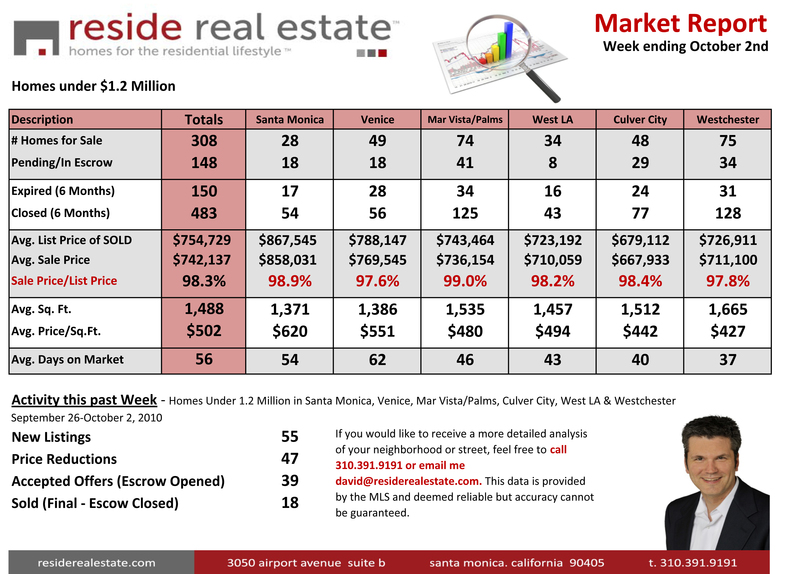 Today, we have our weekly market report for our 6 neighborhood communities here on the Westside of Los Angeles: Santa Monica, Venice, Palms and Mar Vista, Culver City, Westchester and West LA. What we are going to look at today is the median sold price of homes last month, September, versus where we were a year ago. So, it’s a good way to get an indication on what’s going on in the market and what’s going on in your neighborhood and you’re going to quickly find out that not all of the neighborhoods are doing the same thing. Hello everybody and welcome to another episode of the Reside Daily Bite; I’m your host, David Doucette. And today, some interesting news or some good news coming out of Congress; this was reported in the Mercury News in the Silicone Valley at MercuryNews.com and you’ll see a link to that on my website at residerealestate.com. The Reside Daily Bite will have a link to this news article below the video. 062. How Accurate Are Zillow’s Zestimates? Hello everybody and welcome to another episode of The Reside Daily Bite; I’m your host, David Doucette and today, we’re going to talk about Zillow and their Zestimates. Before I jump into that, I just want to let you know, if you like the kind of content that you’re seeing here today, you can head over to www.facebook.com/resideFAN and you can like us over there. I also encourage you to send this link to any of your friends and associates who you think might find this information helpful, especially today’s video. If you have any friends that are thinking of selling their home, this is a very good one to send them because we’re going to be talking about Zillow and their Zestimates. Welcome everybody to another episode of The Reside Daily Bite; I’m your host, David Doucette and I am throaty; my voice is about 75% and I was out of the office yesterday, so, there was no Bite yesterday. I was home sick and I did have just a little thought of recording a Bite at home but that would have been a disaster so, I didn’t. Today’s bite is an interesting one. It’s an article that came out last week out of the San Diego Tribune titled, “Downsizing is Booming“. And it’s interesting because the first line says, “Goodbye, McMansion. Hello, bungalow, condo or suburban split-level.” So, what they’re saying is, really, the era of McMansion is over and people are going to be living in smaller homes and being a little more mindful of their space in a living. Hello everybody and welcome to another episode of The Reside Daily Bite; I’m your host, David Doucette and today, I want to talk to you about an article that came out of the Orange County Register last week, entitled, “1 in 3 Unlikely to Qualify for Mortgage“. 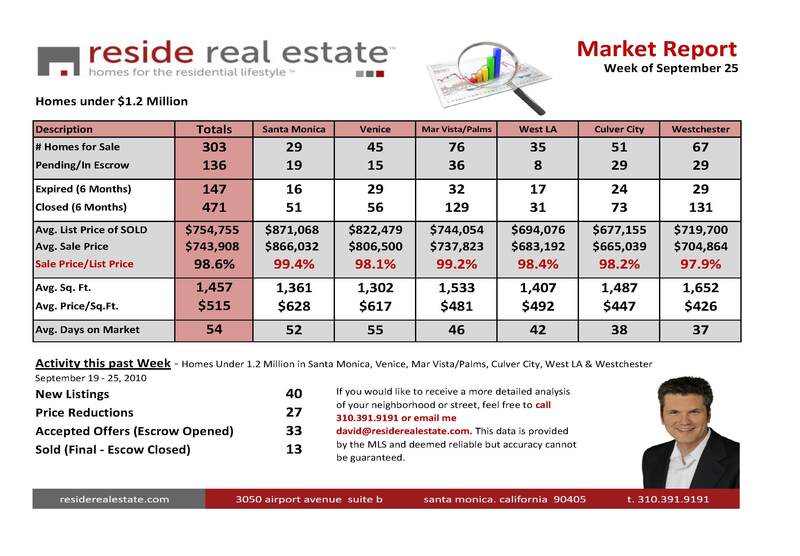 Hello everybody and welcome to another episode of The Reside Daily Bite; I’m your host David Doucette and today, we have this week’s weekly market report for the Westside of Los Angeles for the communities of Santa Monica, Venice, Mar Vista/Palms, West LA, Culver City and Westchester. You can also visit my website to download and print out this report. And that is residerealestate.com/blog and look for episode 059 and you can download it right there. Alright, let’s jump into the activity today. I want to talk specifically about Santa Monica. Hello everybody and welcome to another episode of The Reside Daily Bite. I am here with Lee Fox of Koodooz and we’re getting ready to record a podcast interview. So, this is a little mini trailer of what you’re going to hear on the podcast. And Lee, what are we going to talk about today? 057. What is Consumer Confidence Index? Happy Friday everybody and welcome to another episode of The Reside Daily Bite; I’m your host, David Doucette. Today, I want to talk to you about the Consumer Confidence Index. It’s still going to be a happy Friday after we’re done talking about it. The Consumer Confidence Index is a number that is used to measure the confidence of how consumers feel about the economy based on their spending and saving habits. It’s a very important number because the Federal Reserve will look at that number when they’re deciding whether to make changes in the interest rate. The stock market pays attention to that number, as well. So, it’s a very important number. Welcome everybody to another episode of The Reside Daily Bite. The title of this show today is called “Good Realtors Work, Great Realtors Network” and the evidence of that today (you didn’t know that, did you?) is I’m here at a Tweetup event that my co-host, Michele, and myself put together. We did that to basically take Twitter, bring it offline, make more of a relationship here on the Westside community and build some relationships here. I discuss some overall figures, statistics and analysis for Westside housing Market. Also included in the discussion is the recent activity this past week for homes under $1.2 million in the communities of Santa Monica, Venice, Mar Vista and Palms, West LA, Culver City, and Westchester. After the successful Coastal Clean Up Day last Saturday, I’m presenting to you the results of the cleanup. The total number of volunteers who came out clean the beaches and some of the peculiar items recovered from different coastal clean up sites.